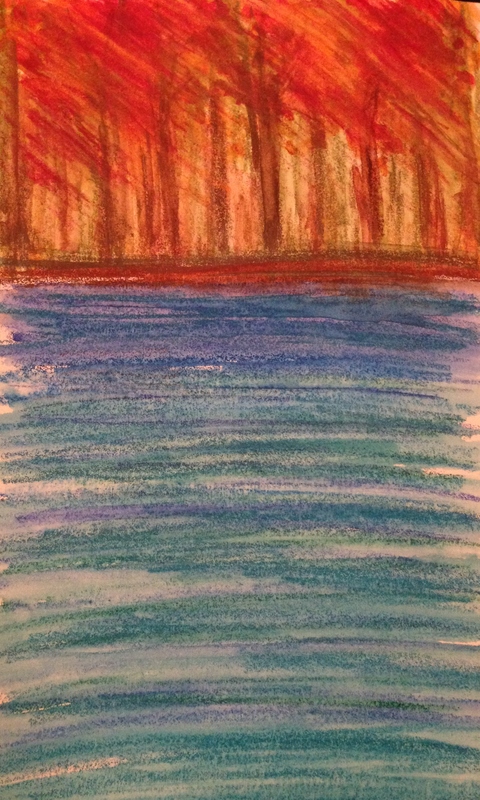 I was playing with some new Neocolor II water-soluble crayons and my Cotman travel watercolor palette and conjured up this little scene, which brought some peace at the end of a looooong day. Refreshing! That’s what art is for me. And oddly, doing a painting like this before bed can even help my sleep. Weird, huh? I hope you have a wonderful, crisp, colorful and creative Sunday. Peace. < Selfie Challenge, Take Two! I love the colours on this. It’s definitely evocative of the season. Beautiful Laura, thank you for the colorful morning wake up. That’s a stunner. The cool blues and greens set off that blaze. And it looks like a blaze, almost. The water is calming, but I especially love the look and feel of the foliage scene above the water! Thanks, Teresa! I’m glad you enjoyed it! It even looks peaceful. I have started to paint in evenings so relaxing. Yay! Sailing is fun!! Although I’d have no idea how to actually make the boat go lol but have fun! Does sound perfect, Jill! Glad you had fun! Definitely a transition into fall. I like the play of warm and cool colors! Thanks Kari! I just grabbed the colors that struck me. lol. chucking over here 🙂 I still think your subconscious was at work, without your awareness ! Thank you! I hope all of the books and DVDs I’ve taken in (and youtubes) in the past year have taken root someplace! :)))) And all of your posts are mini art lessons, too! isn’t it great to find a good way to relax? that’s wonderful! You get some great effects with those Neocolour crayons. Whenever I see your work I’m tempted to fish my tin of Neocolours out and do something loose and vibrant like this. The effect has usually worn off by the time I get home though! LOL, Michael! They are vibrant, aren’t they? I think that’s what I love about them. Inktense are too, but they have a scratchy feel, whereas these guys are like hard butter. Love them! I’m glad you enjoyed it! The fiery orange trees and the fading effect in the distance is stunning! Aww thank you so much!! Glad you like it! For sure better than watching weird stuff or the news on TV before bedtime… Love the colors in this one! Seems like light shining through those trees.. Beautiful!!! Beautiful, like looking over a tranquil sea to a far shore, aflame with the anticipation of Fall. Thank you for sharing. You are so sweet. You did get it right, and I am fine with you calling me “H”, so much simpler ;D.